•Given a chance to walk back his comment, the vice president was noncommitte. Vice President Joe Biden has left the door open for a possible run for president in 2020. Biden told reporters in Washington on Monday that he is not ruling out a run for the White House, even though he would be 78 years old if he took the oath of office in a little over four years from now. The vice president reportedly made the statements with a smile, prompting some reporters to wonder if he was being serious. 'Yeah, I am. I am going to run in 2020,' Biden said when asked if he would run for office again. Biden, who turned 74 last month, will turn 78 shortly after the 2020 election. Ronald Reagan was just a few days short of turning 78 when he left office in January 1989, making him the oldest person to serve as president. The vice president decided to not seek the White House in 2015 and instead backed this year's eventual Democratic presidential nominee, Hillary Clinton. He ran unsuccessfully for his party's nomination in 2008, when now-President Barack Obama selected him as his running mate, and in 1988. Biden last year announced he would not run for president after wrestling with doubts about whether he and his family were ready for a grueling campaign while still mourning the death of his son, Beau Biden, who died in May 2015 from brain cancer. 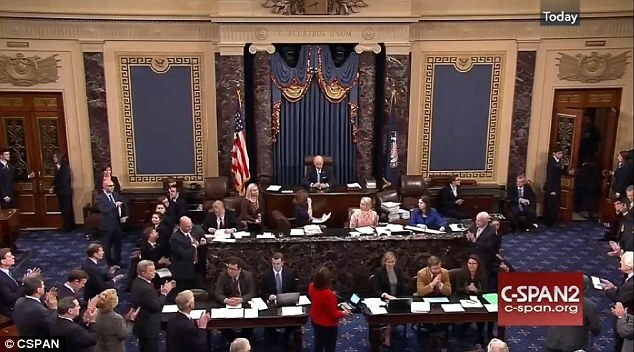 The vice president grew teary-eyed on Monday when a Senate session which he presided over paid tribute to Beau Biden by renaming a bipartisan bill designed to expedite government drug approvals and boost biomedical research. 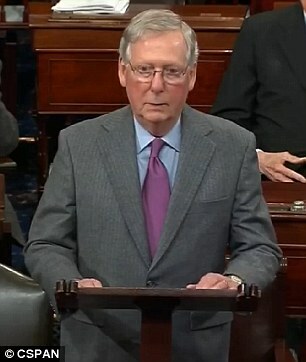 The gesture was extended by Senate Majority Leader Mitch McConnell, a Republican from Kentucky, and it drew applause from all of the lawmakers in attendance who gave Biden a standing ovation. 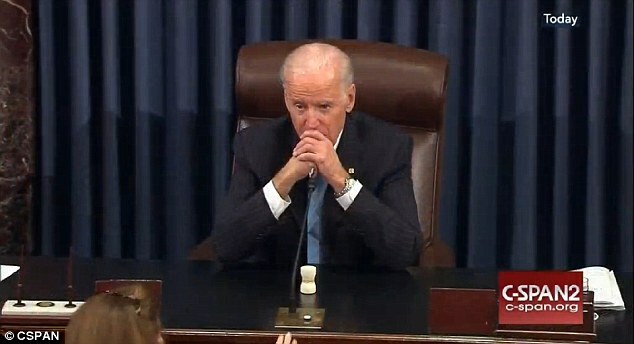 Biden grew so emotional that an aide had to hand him a tissue. The bill envisions providing $6.3 billion over the next decade, including $1.8 billion for cancer research. President Barack Obama had placed Biden in charge of a 'moonshot' to find ways to cure and treat the disease.